Most people have never heard of the federal 340B drug discount program. It was created by Congress in 1992, deriving its name from Section 340B of the Public Health Service Act, and is administered by an equally esoteric division within the Department of Health and Human Services (HHS), the Health Resources and Services Administration (HRSA). The program requires drug manufacturers that participate in Medicaid to provide heavily discounted outpatient drugs (typically between 20 to 50 percent) to certain health facilities, known as “covered entities,” which provide general health services as well as treatment for specific diseases to uninsured, low-income people who could not qualify for Medicaid or Medicare. In theory, the entity, or pharmacy it contracts with, is supposed to sell the heavily discounted drugs and pass along the savings to their low-income patients but because of vague language in the statute and regulations, and lack of Congressional oversight, this is not always occurring. According to both government officials and media reports, the 340B drug discount program has drifted far from its original mission of helping uninsured, indigent people get access to prescription drugs by now enabling hospitals and pharmacies to generate millions of dollars in profit. Ultimately, it is consumers and taxpayers that pay. Since the creation of the 340B program 22 years ago, Congress and HRSA have expanded the definition of qualified covered entities. The most recent change occurred under the Patient Protection and Affordable Care Act (ACA), often referred to as Obamacare, which expanded the types of facilities eligible to participate in the program. Covered entities include federally qualified health centers, Hawaiian and Native American health centers, Ryan White HIV/AIDS program grantees, Disproportionate Share Hospitals (DSH), free-standing cancer hospitals, children’s hospitals, rural and sole community hospitals, critical access hospitals, and specialized clinics like black lung or tuberculosis clinics. Covered entities are usually eligible to participate in the program because they receive some sort of federal support, such as a grant, or meet certain government requirements in providing care to the medically underserved. According to HRSA, the “340B Program enables covered entities to stretch scarce Federal resources as far as possible, reaching more eligible patients and providing more comprehensive services.” Each year, a covered entity must be recertified by HRSA. 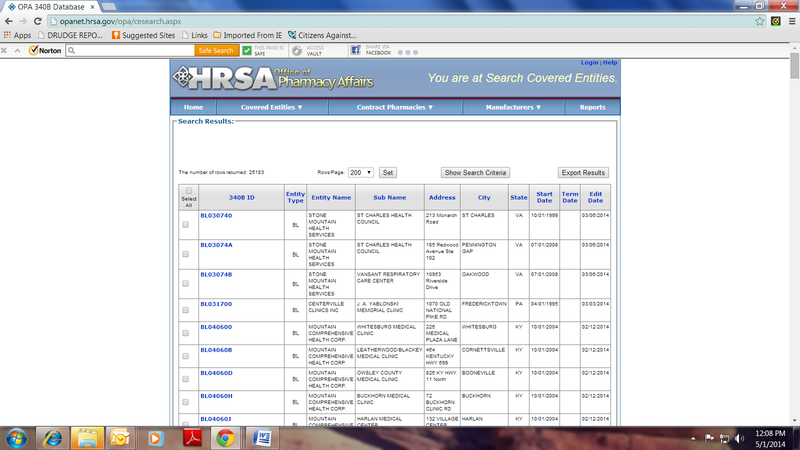 HRSA’s database shows there are approximately 25,000 covered entities. According to the Government Accountability Office (GAO), the number of hospitals participating in the program has grown from 591 in 2005 to 1,673 in 2011, or approximately one-third of all hospitals in the United States. In 2010, HRSA wrote regulations to allow covered entities to use a limitless number of pharmacies to fill their patients’ prescriptions instead of just one pharmacy, which had been the norm starting in 1996. As a result, the number of single pharmacies operating as a 340B contract pharmacy has grown by 770 percent, from 3,785 pharmacies participating in 2010 to 30,046 in 2013. In February 2014, the HHS Office of the Inspector General (OIG) released a report that found several problems with these new complex contracts between covered entities and pharmacies. The OIG found that these arrangements can lead to drug diversion (drugs going to ineligible people) and subjecting drug manufacturers to duplicate discounts (occurs when 340B discounted drugs are dispensed to Medicaid patients), both of which are statutorily prohibited. The OIG believes the “lack of clarity on how HRSA’s patient definition should be applied in contract pharmacy arrangements” is leading to these problems, and that covered entities are not following HRSA’s guidance to conduct robust oversight and independent audits of prescription transactions. Furthermore, the OIG found that some covered entities simply failed to offer the discounted 340B price to an uninsured patient at their contract pharmacy, which was the point of the program in the first place. Amazingly, the OIG report also stated that “neither the 340B statute nor HRSA guidance addresses whether covered entities must do so.” Sadly, if an eligible uninsured patient does not get the discounted 340B price, the patient likely pays the full price for his or her prescription. The February OIG report is only the latest analysis of the 340B program. In 2011, the Government Accountability Office (GAO) released a report entitled, “Drug Pricing: Manufacturer Discounts in the 340B Program Offer Benefits, but Federal Oversight Needs Improvement.” The ACA had mandated that the GAO address certain questions about the program, such as the extent to which covered entities generate 340B revenue, how manufacturers’ distribution of drugs at 340B prices affects covered entities’ or non-340B providers’ access to drugs, and HRSA’s oversight of the program. The GAO also found that 13 (45 percent) of the 29 covered entities it interviewed had profited from the 340B program and 6 (21 percent) did not even report enough information to determine the extent to which revenue was generated. Furthermore, the GAO found that 18 (62 percent) of 29 covered entities it interviewed “had generated 340B revenue by receiving reimbursement from third-party payers … and most reported that they generated more 340B revenue from patients with private insurance and Medicare compared to other payers.” In other words, the entities were selling the discounted drugs to privately-insured patients or Medicare patients and pocketed the difference. For example, according to the April 3, 2013 installment in the Observer series, “Duke University Hospital purchased $65.8 million in drugs in 2012 through the 340B discount program, which saved $48.3 million. It sold the drugs to patients for $135.5 million, for a profit of $69.7 million. The profit would have been $21.4 million if Duke had not participated” in the 340B program. It is long past due for Congress to conduct vigorous oversight of the program and HRSA. Congress must reform 340B so that it serves its original purpose of helping uninsured, low-income people get access to life-saving pharmaceuticals and not be utilized as an ATM by hospitals and pharmacies to expand their profit margins.